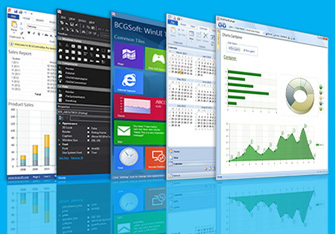 BCGControlBar library is an MFC extension library that allows you to create Microsoft Office 2000/XP/2003/2007/2010/2011/2012/2013/2016 and Microsoft Visual Studio-like applications with full customization options (Ribbons, Customizable toolbars, menus and more) and a rich set of professionally-designed GUI controls such as Calendar, Grid, Editor, Gantt and many others. BCGControlBar library has more than 200 thoroughly designed, tested and fully documented MFC extension classes. Our components can be easily incorporated into your application and save you hundreds of development and debugging hours. The highlighted features are: * Office 2007/2010/2012/2013/2016-style Ribbon control * Windows 10 and Visual Studio 2015 support * The Windows 8 style Tiles control * Visual Studio-like Docking Panes * Customizable Menus and Toolbars with Visual Studio and MS Office look * More than 50 charts (2D and 3D) * Gauge controls including circular, linear gauges, numeric indicators and knobs * Skinned dialogs and forms * Advanced property sheets and wizards * Calendar and planner controls * Grid and Report controls * Tasks Pane * Visual Studio-like Toolbox Pane * Advanced Edit control with IntelliSense support, collapsed blocks and syntax highlighting * Gantt chart * Miscellaneous GUI Controls such as Visual Studio-like property grid, advanced tab control, date/time pickers, various color pickers, calculator, hyper-link controls and more * A lot of predefined dialogs such as Progress Dialog, advanced Message Box, Image edit dialog and others * Easy-in-use Ribbon and Toolbar designers allows to create advanced great-looking UI in minutes * Application Wizards for all supported Visual Studio versions (from 6.0 to 11) This products is a choice of thousands of developers and well-known companies worldwide. The part of BCGControlBar Pro was licensed by Microsoft and incorporated in Visual C++ 2008 and 2010 MFC classes. Changes: This release includes notification badges support, advanced frame caption bar, editor error indication and other new features and improvements. Royalty free. Only DLL and XML files are allowed for distribution. BCGControlBar Library License Agreement The enclosed software that includes source code, sample programs, libraries and documentation (hereinafter the Software) is licensed, not sold, to you by BCGSoft Ltd. (BCGSoft) or its distributors for use only under the terms of this License, and BCGSoft reserves any rights not expressly granted to you.